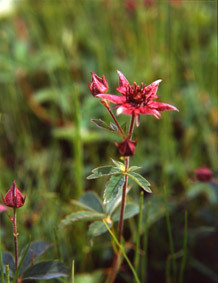 This was my first close-up photo of a flower - Marsh Cinquefoil Potentilla palustris - taken during a birding holiday to the Isle of Lewis in 1985. Before that time, I had no interest in flowers, having spent much of my holidays in my youth working on a nursery, but there were so many interesting plants around, I could not help but get involved in capturing images of them. I was rather disappointed with the results from that trip, so I enrolled in several courses both on photography and plant identification. After 20+ years, I’m still learning and still enjoying myself. The photo lacks sparkle, the plane of focus is in the wrong place and there is insufficient depth of field to render the flower sharp over its whole width. Most especially, the petals towards the camera are out of focus. I started out with a Bronica ETRS, but found I was getting too many pics spoiled by camera vibration, also, having to wind on manually after every frame meant that the camera moved, so I had to line it all up again. A new camera was needed, so after much deliberation I went for the Rollei 6006 with its built-in motor wind, through the lens metering, ultra quiet electronic shutter, its facility for mirror pre-release and its superb Zeiss Planar lenses - in my opinion the finest medium format camera available at that time. This was my early setup on the left, the Rollei with 80mm lens plus a supplementary close-up lens of +1 or +4. The flash gun does not have TTL metering. Here, I am using the technique learned from a course on close-up photography. Using a rotary calculator, I have worked out the flash to subject distance to give me the correct amount of balanced flash for the subject and use the tape measure to position the Vivitar 283 flash gun at the correct distance. With the flashgun held at a 45 degree angle to the camera, the subject is lit by both flash and daylight to give the correct exposure - filling in when the light is harsh or adding highlight when the light is dull - but the flash misses the background included in the view, so rendering the background underexposed by about 1 stop. 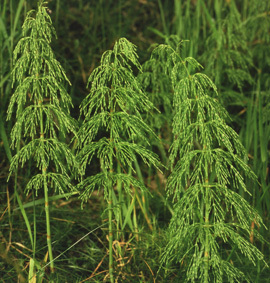 This brings the subject out from its background - as shown by the Wood Horsetail Equisetum sylvaticum in the image on the right - while maintaining some detail in the background but without rendering it too dark which in my opinion looks so unnatural for daylight photos that are taken with flash alone. 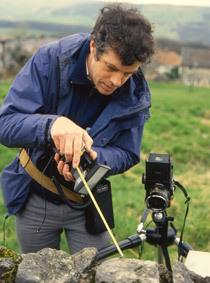 This was my eventual setup with the Rollei, having added a 120mm Makro Planar lens, a bellows and a Metz 45CT5 flashgun which does have TTL metering. Flash and daylight are metered separately, allowing each to be controlled independently, so no more having to calculate the flash distance and use a tape measure, I could simply set up the equipment to get the exact shot I wanted, wait for the wind to drop enough for the plant to stop moving and press the remote release. 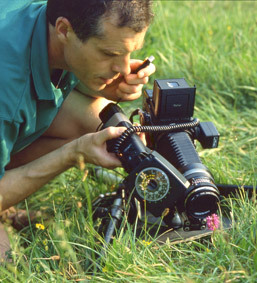 The Rollei has an “in lens” shutter, which means that the flash can be synchronised with any shutter speed. As well as being able to compensate exposure by altering the shutter speed, by use of the ISO dial on the flash adapter I can bracket the flash exposure if necessary. 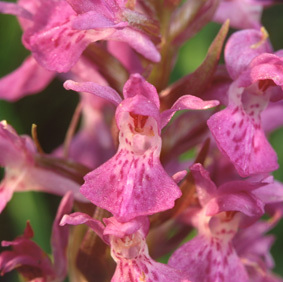 The image on the right, Northern Fen Orchid Dactylorhiza purpurella, is the one that was taken with the setup shown. With several lenses, bellows, flashgun, batteries, Benbo Mk1 tripod and all the other accessories that I carried, this was a very heavy outfit. Fine if I was working in a small area close to the car, but when it meant trekking long distances, then the weight started to tell.